I never read "classic" young adult literature when I was technically a young adult. I thought it was too fluffy or too silly or too angst-ridden to be interesting. Let's face it: I was a book snob. Still am kind of a book snob, but at least I realize my error and am trying to correct it. You know how the human mind makes odd associations sometimes, with nothing to back up the association other than some fluke of a synaptic bridge? When I was younger, I thought that this was the sequel to Summer of My German Soldier. I mean, they both had similar covers in that the girl was white, blonde, straight-haired, and conventionally pretty. They both seemed like mildly tragic books. So, I assumed that the German Solder left/died, and didn't promise his girlfriend a rose garden, and so she worked through her grief. 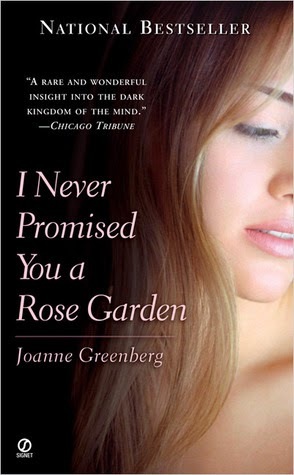 I came up with that when I was ten and I feel like I would have rather read that nonexistent book than the actual I Never Promised You A Rose Garden. This is a book that wants you to know that it is about Mental Illness (capitalized, naturally) and how one brave girl, with the help of her brave and innovative psychiatrist, was able to overcome her "inner demons" of schizophrenia and function in "the real world." Oh, dear. That sounded awfully harsh and sarcastic, didn't it? The story opens with Deborah's parents reluctantly checking her into a treatment center after a suicide attempt. Deborah's father, in particular, really doesn't think it's necessary. We get a bit of background on the parents: both of them come from immigrant families, and Esther, Deborah's mother, was considered to have married beneath her when she married Mr. Blau. Esther's father made his fortune in America but still suffered prejudicial treatment and hatred because of being an Eastern European Jew. Consequently, he set very high standards for Esther, and then Deborah, to fulfill. His descendants must be brilliant, pretty, successful--everything to "show them" that she's good enough to be in "in society." I apologize for the overabundance of sassy quotation marks, but I don't want to give the impression that I agree with the agenda that good ol' Gramps was pushing, although I understand where he was coming from. Meanwhile, Deborah has created a world within her mind, called Yr. This world has gods that torment her, as well as its own language and mythology. Many of the passages referring to Yr, with Deborah speaking in Yri, are extremely difficult to follow, which I suppose is the point. The world of Yr felt a bit like a ripoff of Lovecraft, although I cannot speak to that particular type of fiction's popularity in this time period. Her therapist has decided that she will take on Deborah's case, even though she (the doctor) is Very Important and Very Busy, because she wants a challenge and she is determined to cure Deborah. In addition to the usual menu of treatments served at mental institutions in the past (the "cold pack" where they mummify you in cold, wet sheets to calm you down is particularly popular here! ), Deborah receives no medication, just talk therapy. I think talking about problems is exceedingly helpful, but at this point, depending on what you believe about mental illness, you'll either accept or reject the book. 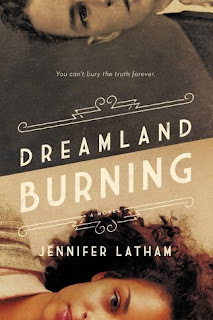 Doctor Fried, who escaped Nazi Germany but saw many of her patients there lose their lives, talks Deborah through the land of Yr and her formative years. Deborah believes that she is forever lost--that she is corrupted through-and-through, and gives the example of trying to kill her baby sister. As they discuss family issues, it comes out that the good doctor believes that Deborah's problems all stem from the undue pressure placed upon her by her grandfather, as well as her parents' behavior. There is even a hint that Jacob, Deborah's father, has a lustful love for her that shows in his overprotective attitude. Finally, there is the issue of Deborah's heritage: as a Jewish girl, she was constantly tormented as a girl because of her religion and ethnicity. All of this, Doctor Blau concludes, has driven Deborah to create her own world of suffering within her own mind. 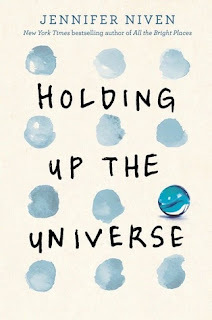 Basically, this book is of the mindset that your parents and your upbringing make you mentally ill.
For some mental illnesses, such as eating disorders, I think that disordered behavior on the part of close family members can contribute to poor body image or sense of self-worth, which can morph into a disorder. Experts do acknowledge that trauma while young or some other sort of environmental factor can contribute to schizophrenia, but there is also a genetic component. In addition, scans of patients with schizophrenia show that their brains look different. Physically. This is all easily Googleable (not a word) and comes from sources like the Mayo or NAMI. I would think that a disease that physically alters one's brain isn't something that can be overcome by force of will, which is basically the plot of this book. Joanne Greenberg/Hannah Green based this on her own experiences, and she is currently living a very stable life in Colorado. Everyone's experience with mental illness is different. I would have preferred it had Greenberg written this as a straight memoir. As a novel, it feels Disneyfied somehow (and not in a Frozen-good way). As someone with depression and a brother who has bipolar disorder, I cannot swallow the line about thinking yourself out of mental illness. We've finally started to understand that telling a depressed person to "just think positively!" or "look on the bright side!" doesn't help. At all. So, why do so many readers blithely accept Deborah's "I willed it away" "cure" for schizophrenia? I don't even think it matters where you stand on the meds vs. no meds debate--what it boils down to is: Can you think your way out of mental illness. This turns into a sort of mental mirror maze. Let's use Deborah as our example. She is trapped in Yr, the land of her mind. However, she uses the mind that we (and she) have accepted as misfiring, in a way, to fix itself. Using your brain to diagnose itself and then cure itself is like a bizarre form of biological and psychological nepotism. Other than the thematic issues, I felt that the prose--such as it was--was excessively leaden, and it took me far too long to read this because I kept feeling so darn bored. I would have given up, only I wanted to see this "fantastic journey" to its heartwarming Disney climax. Well, sort of. Writing about mental illness is extremely difficult, and I find it almost impossible to coherently review books that talk about mental illness because a) I have a very complicated relationship with it and b) everyone FREAKS OUT about mental illness. Yes. Even now. In 2014. I think I deleted three drafts of this review. So it might be kind of boring or kind of scatterbrained, but it was the best I could do under the circumstances. Maybe I should have just willed myself to write an awesome review.